The Rolling Stones have postponed the North American leg of their current No Filter tour as Mick Jagger seeks medical treatment. The tour was due to kick off in Miami on April 20. The news was confirmed in a statement from the band on Facebook, which read, "Unfortunately today the Rolling Stones have had to announce the postponement of their upcoming US / Canada tour dates - we apologise for any inconvenience this causes those who have tickets to shows but wish to reassure fans to hold onto these existing tickets, as they will be valid for the rescheduled dates, which will be announced shortly. 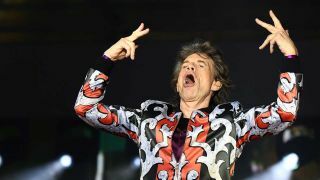 Jagger added, "I’m so sorry to all our fans in America & Canada with tickets, I really hate letting you down like this. I’m devastated for having to postpone the tour but I will be working very hard to be back on the road as soon as I can. Once again, huge apologies to everyone." Details of Jagger's condition have not been revealed. The affected dates are listed below. Two weeks ago, the Stones announced the release of a new compilation album, Honk, and followed it by releasing footage of the band performing Wild Horses with Florence And The Machine singer Florence Welch.